The Club’s Premier League team the Broncos were in action on Sunday, playing in the BAFA National Plate competition. This is a new tournament organised for the best of the teams that didn’t make the National Finals day. 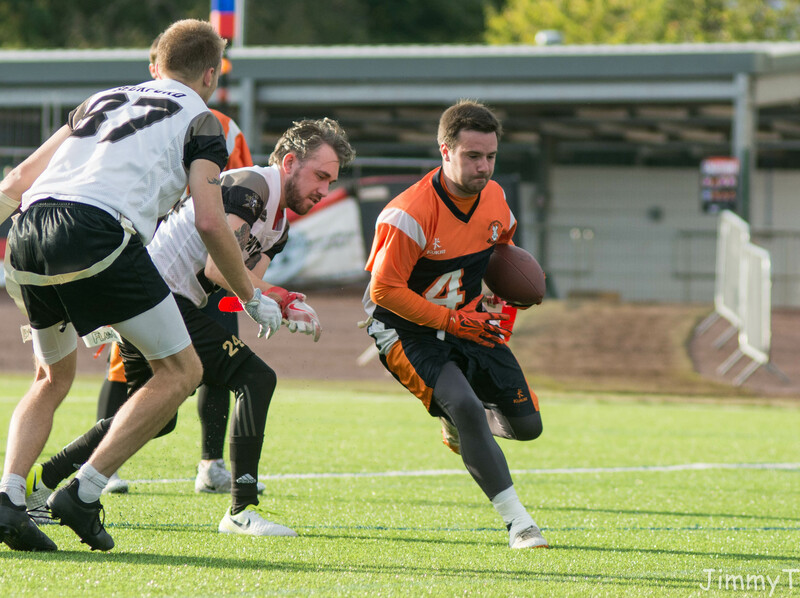 The Broncos have always been considered one of the top ten teams in the UK, but with only two teams from the HNC allowed into the Finals, it is always a battle with Aberdeen Oilcats and Glasgow Hornets for those places. This year, even with the Broncos injury problems, they were still close to making it. So the Plate was their chance to show their class. Going into the day, because of the injuries and players unavailable, the Broncos could have had to play with four players. Fortunately Callum Woods declared himself fit to play. In their first game, Grangemouth played Northants Phantoms. Unknown opposition. Early on, the teams traded scores, but the experience of the Broncos meant they were more adaptable and began to pull away. There were periods of this game that the Broncos played with four players as injuries were patched up on the sideline, but the Phantoms couldn’t capitalise on the extra player. 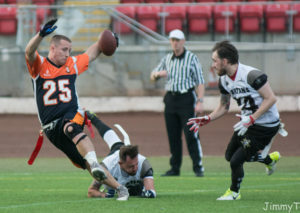 The Broncos took the game 51 – 33. Their next opponents were the Sheffield Vipers. 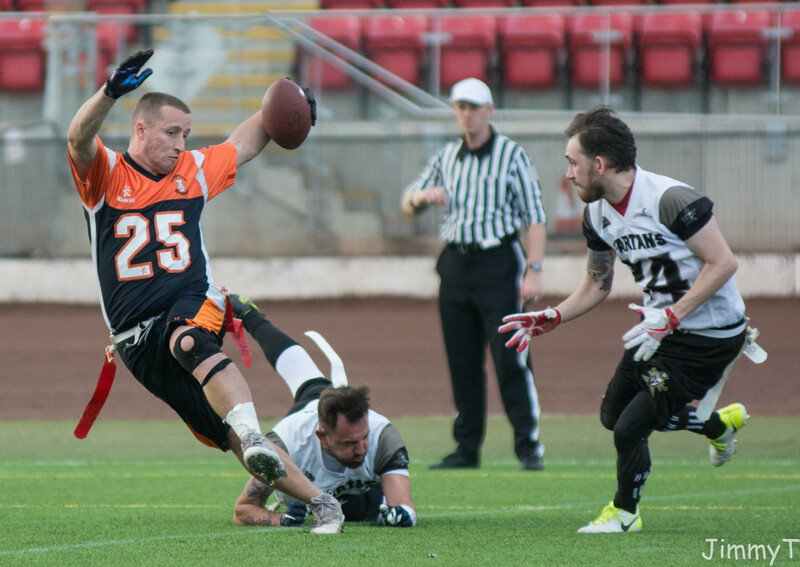 The Broncos had lost to the Vipers in the regular season, so were looking for revenge. Given that the Vipers had just knocked out the tournament favourites, the Victoria Park Panthers, with a five man team, that was going to be a tall order. 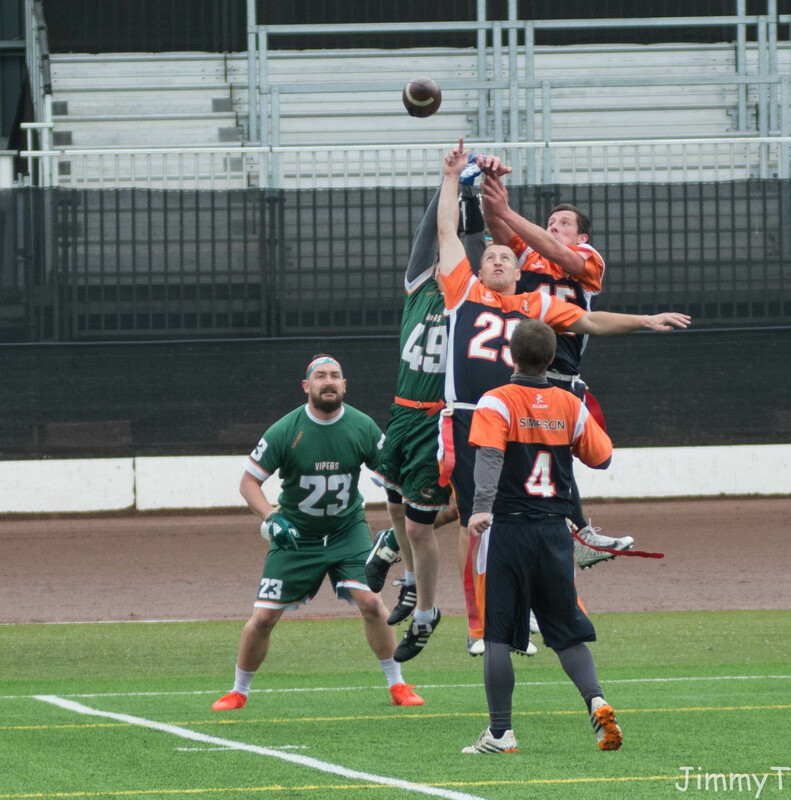 Once again the teams traded scores early on, but this time the Broncos couldn’t pull away. In the end, it came down to one single play. The Broncos scored a touchdown with seconds on the clock to get back to a one point deficit. They decided to go for the more difficult two point conversion to get the win, rather than the easy one point for a tie and the resultant overtime. The pass from Scott McKenzie to Liam Fleming for the win was a laser! 49 – 48 to the Broncos. At the start of the day, the Broncos were just aiming to survive the day, but here they were In the final. The opponents were the Aylesbury Vale Spartans. The Broncos had played the Spartans at Flagging New Year in January, so knew that they were up against a fast playing team. With the Broncos already running on fumes, this was going to be a huge task. The Broncos scored on their opening drive then stopped the Spartans. When Grangemouth scored next, they had the all important two score lead. Before the half though, the Spartans clawed it back to just one score and they would start the second half with the ball. The Broncos took full advantage of the break to catch their breath. Stopping the Spartans on their first drive of the second half restored the Broncos two score lead. 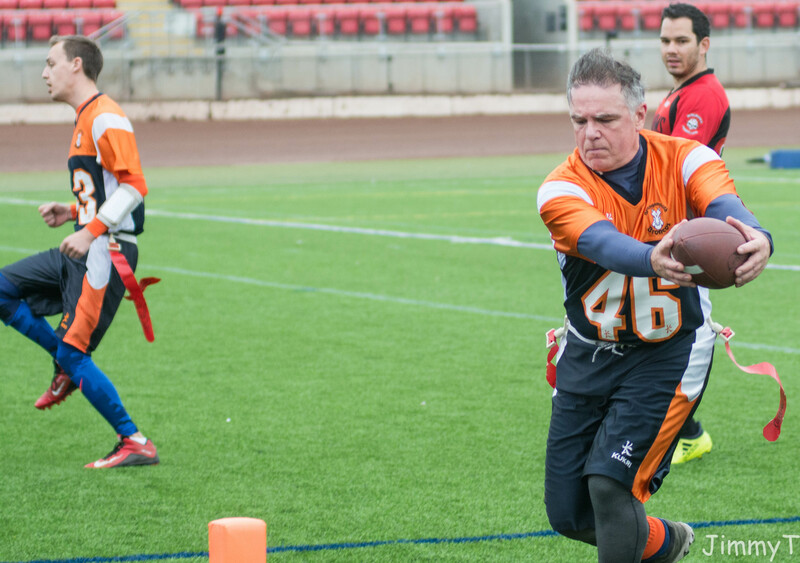 While the Spartans did manage to keep scoring, they couldn’t stop the Broncos. In the last drive, the Broncos just had to use as much time as they could to kill the clock. Getting a final score as time expired maybe exaggerated the win. 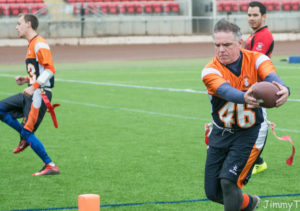 The game ended 45 – 31. 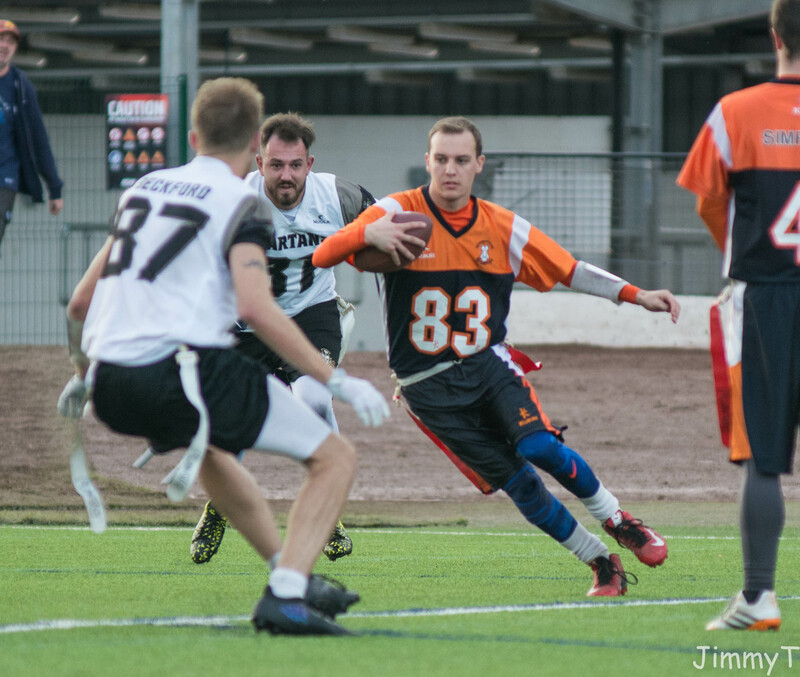 The Broncos were the BAFA National Plate Champions. The five players who played every down had given blood sweat and tears to win, but the pain was forgotten as they celebrated with their supporters. Not the first silverware the Broncos have brought home, but the biggest and almost definitely the most satisfying. 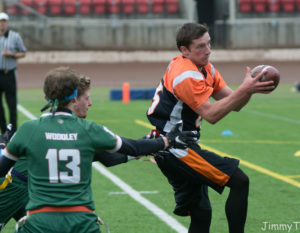 In the three games, Scott McKenzie threw almost every scoring pass and scored on a run, Callum Woods scored ten touchdowns and two extra points, Liam Fleming scored eight touchdowns, six extra points and the two point conversion, Kevin Simpson scored three touchdowns and Jimmy Thomson scored three extra points.